Meach Sovannara’s life isn’t easy. It never has been. Cambodian residents who speak out against the government and other political dissidents can expect swift action if their words are heard by enough people. It happened to Sovannara in 2003 when he and his family had their lives threatened as a result of such protests. They made it safely to Long Beach. That didn’t stop him from continuing the good fight. 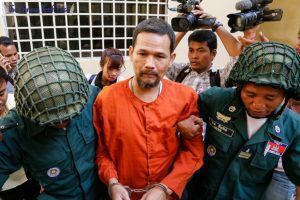 In 2014 he was arrested for giving a speech as spokesman of the Cambodia National Rescue Party. In 2015 he spoke at a protest alongside countless other demonstrators who were upset with their government. He was taken by the police. He was given a twenty year sentence for his part in the protest, to be served inside Prey Sar. It didn’t stop him. He wrote an article elaborating on his own thoughts about the government, then smuggled it out of prison. It was subsequently posted on Facebook where it made the rounds. His time inside only got worse once his overseers found out but by that point the damage was done and there was nothing they could do to stop it. Jamie Meach, his loving wife, demonstrated for his release ever since the 2015 incarceration. She tried the legal route with lawsuits. She made personal appeals to Cambodian officials. She expected nothing to work, but something did. He was released from prison earlier this year, but he made it clear that we shouldn’t expect that to be the end of it. It’s clear that Sovannara probably won’t be able to safely return to Cambodia, but whether he does or not won’t change the fact that he’ll continue to protest political corruption in Cambodia from his new home in Long Beach. After all, we live in an age that makes publication and dissemination of alternative views easier than ever. He plans to be active on social media when possible.